The Richland County Ambulance Service is an integral part of Sidney Health Center's emergency services. Nationally Registered Emergency Medical Technicians provide services throughout Richland County with ambulances in Fairview, Lambert, Savage and two in Sidney. The service is county-owned with operations administrated by Sidney Health Center. 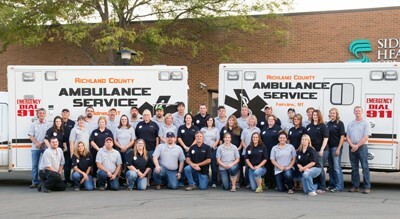 RCAS strives to provide excellent emergency healthcare to residents and visitors of Richland County with passionate, qualified and experienced EMS personnel. By working as a team during dangerous, challenging and emotional situations, these professionals maintain the infrastructure of rural living. We promote safety and public awareness through education, ambulance tours and a presence at community events, as well as provide the public with the knowledge and confidence to help in any life-threatening situation. RCAS speaks collectively with One Voice among both the public and the service itself to foster a healthy team environment and nurture the communities' confidence and trust in our service. The Richland County Ambulance Service takes a pro-active approach in regards to safety awareness through community outreach projects and education within the schools. Along with crucial first responder education, this program includes CPR and first aid training. The program is designed to bring awareness to the community regarding life-saving techniques The latest project involves working with schools, businesses, and high-traffic public facilities on the installation and training of Automatic External Difibulators (AEDs), which are essential life-saving shocking devices.Click here for more information. The EMTs stay apprised of new techniques through monthly meetings and continuing education. The Richland County Ambulance Service relies heavily on the dedication and skill of volunteer EMTs. RCAS offers training at the levels of First Responder and EMT-Basic. The First Responder course consists of about 54 hours and meets twice a week for 7 weeks. First responders will learn basic life support and how to treat patients in order to be a valuable asset on the ambulance. Their primary job initially will be driving the ambulance, but will have patient interaction by assisting in care on-scene. This will allow them the opportunity to gain real-world experience in the field, while the EMT-Basics can focus their attention primarily on patient care during transport. Following the initial First Responder course, students will have the option to take an additional course to transition to the EMT-Basic level. If you are interested in taking the First Responder course, please call 488-2180 for more information. There is a growing body of evidence suggesting the field of Emergency Medical Services (EMS) nationwide, particularly in the rural volunteer sector, has been experiencing increasing problems with recruitment and retention of emergency response staff. If these trends continue, they could lead to the collective failure of the rural volunteer EMS system in the U.S., leaving rural communities unprepared for medical emergencies. RCAS recently conducted a nationwide survey as a means to gather empirical data to support this evidence, identify common issues threatening rural volunteer EMS and present possible solutions to these issues. The survey was successful and yielded a multitude of valuable information that is encouraged to be shared in order to sustain rural ambulance services and provide the best patient care throughout the nation as possible. The Richland County Ambulance Service is pleased to announce the new Montana emergency medical services' license plate. Now every EMS person across the state of Montana can proudly display their role as an EMT on their vehicle by purchasing the newly designed license plate. How do you get the plate? The emergency medical services plate is available for purchase for Nationally Registered Emergency Medical Technicians. Individuals who meet the eligibility requirements may download the application from this site or pick one up at your local motor vehicle office. Complete the application and obtain an authorized signature from the director of your local emergency services department. Submit the application, along with $35.00 for the renewal fee with an additional $15 charged for first time plate fee to your local vehicle registration office. The funds generated from the sale of the license plates will go to the Richland County Ambulance Service, located in Eastern Montana. The service is county-owned with operations administrated by Sidney Health Center. The Richland County Ambulance Service relies heavily on the dedication and skill of volunteer EMTs.